You are never too young or too old to start climbing. Not strong enough, too weak, insufficient upper body strength, rapid exhaustion—these are just petty excuses. Just think, you had so much fun going up trees, windows, and stuff when you were a kid, right? What you need for inspiration is mainly your willpower and the right friendly climbing venue as well as the right people to motivate you. 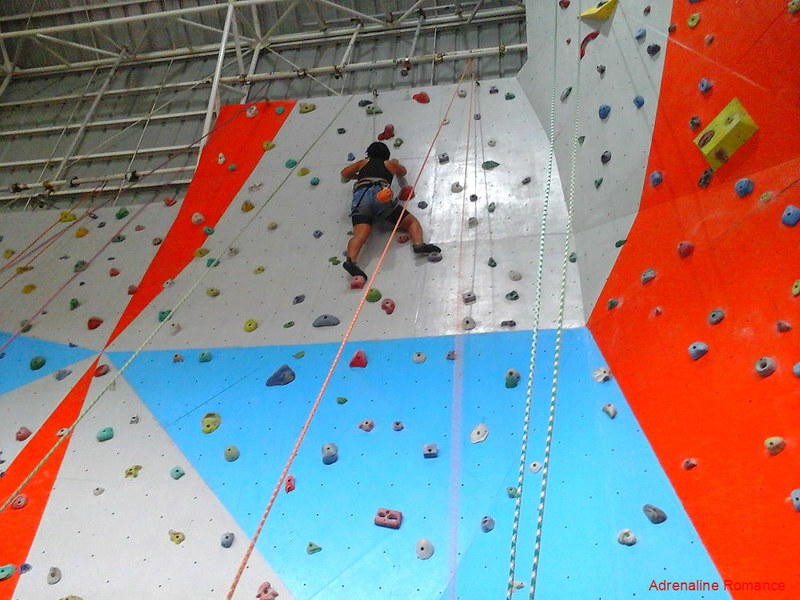 You can find those in Adventure Central Indoor Climbing Center, Iloilo City’s newest climbing venue and your home for fitness and fun. After our Experience Antique tour and Mt. Igcuron ascent, we went strait to Iloilo City where we spent a restful night. 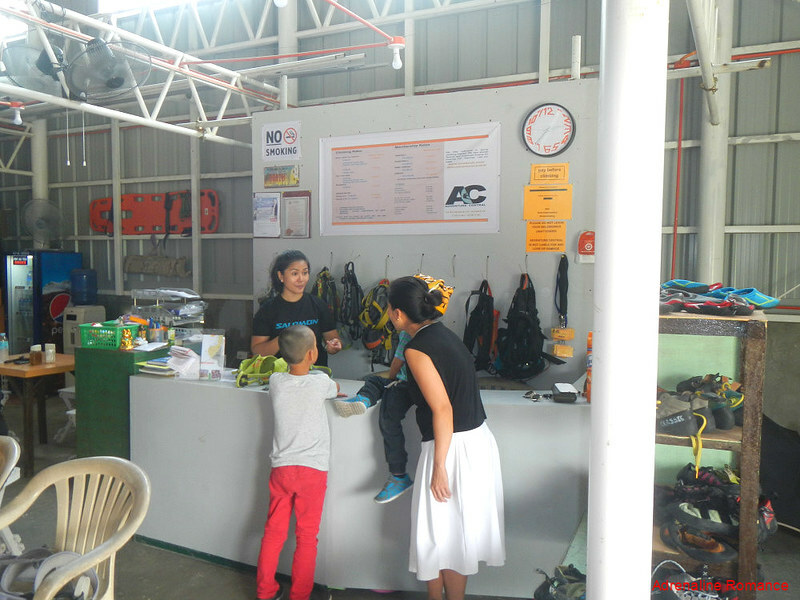 The next day, we decided to visit Adventure Central to say hi to some climber friends and to have a few hours of fun while waiting for our boat trip back to Cebu. 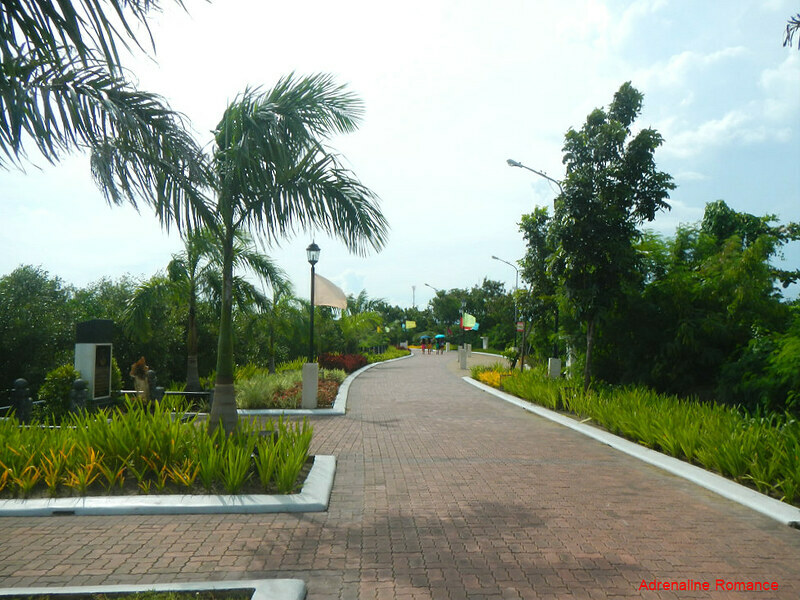 The way towards Adventure Central is through the scenic Esplanade that stretches 1.2 kilometers alongside the Iloilo River, from Diversion Road to Carpenter Bridge. With a carefully trimmed garden strip, an amazing view of the river, and a multitude of food and entertainment establishments, the Esplanade is a cool place to hang out before or after a climb. Our short hike ended near Carpenter bridge where we found this white hangar-like building. 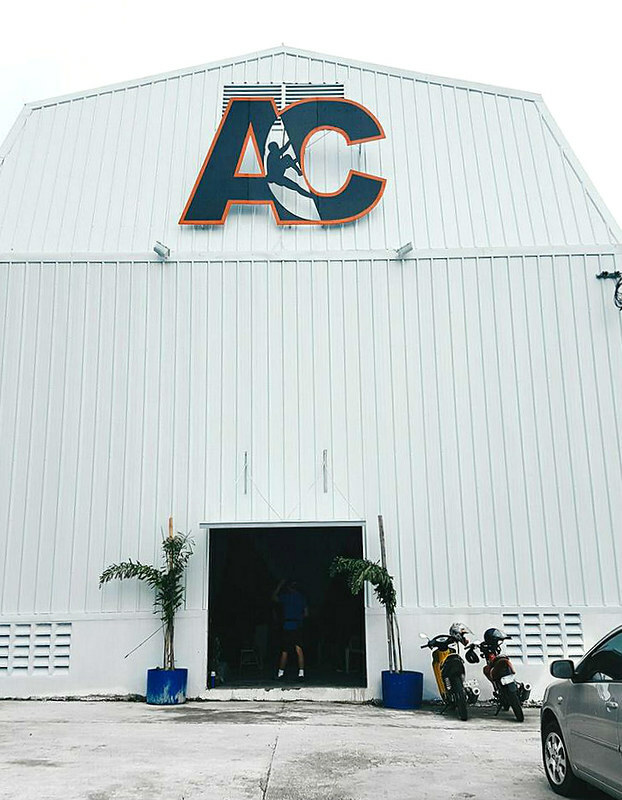 Finally, we were at the doorstep of Adventure Central Indoor Climbing Center, a destination where fun, fitness, adrenaline, and camaraderie all come together. The facility has ample parking space in front of it, so those with vehicles won’t have any problems. It was a busy afternoon when we went inside. Guests and climbers can ask information, rent equipment, inquire about memberships, and more at the concierge desk. We didn’t bring our rock climbing shoes, but that was not a cause for worry. 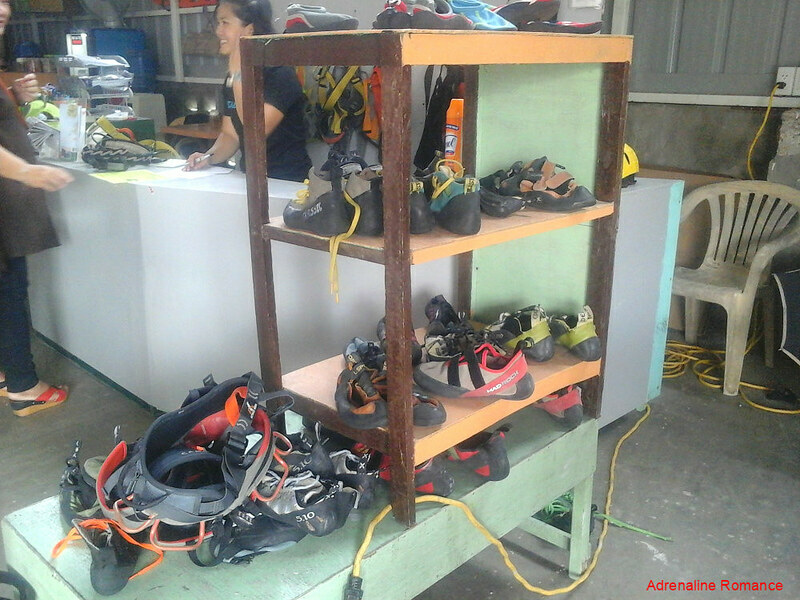 Adventure Central has plenty of high-quality rock climbing shoes for rent. No harness? No problem! 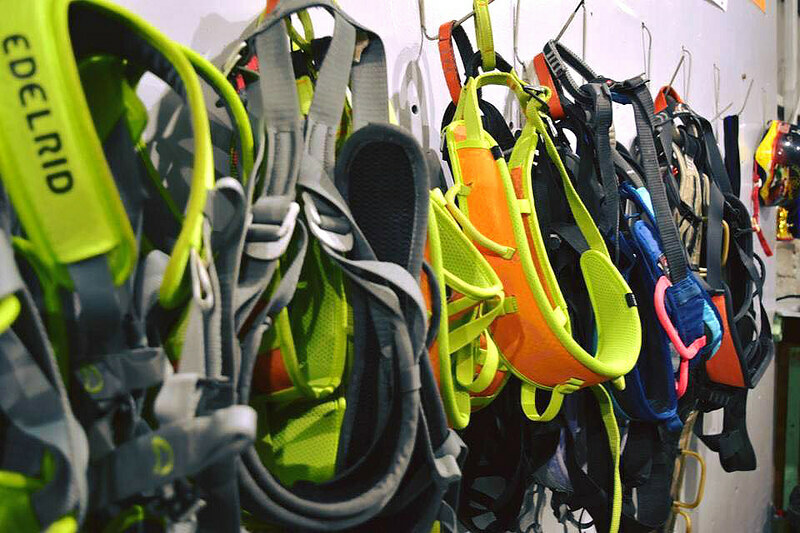 They have plenty of superb—and colorful—standard seat harnesses that climbers can rent at a minimum price. For children whose bodies are too small and slender for seat harnesses to fit snugly, AC has high-quality body harnesses available. Hungry? Thirsty? Adventure Central makes sure that climbers have answers—and a lot of them—to the rumblings of their tummies and the desperation of their parched throats. They have a nice snack bar where guests can buy snacks and drinks. Let’s check out their awesome climbing wall. Vibrant, isn’t it? Their wall spans more than half of the entire facility, which means that there are a whole lot of routes. That translates to hours and hours of climbing fun! 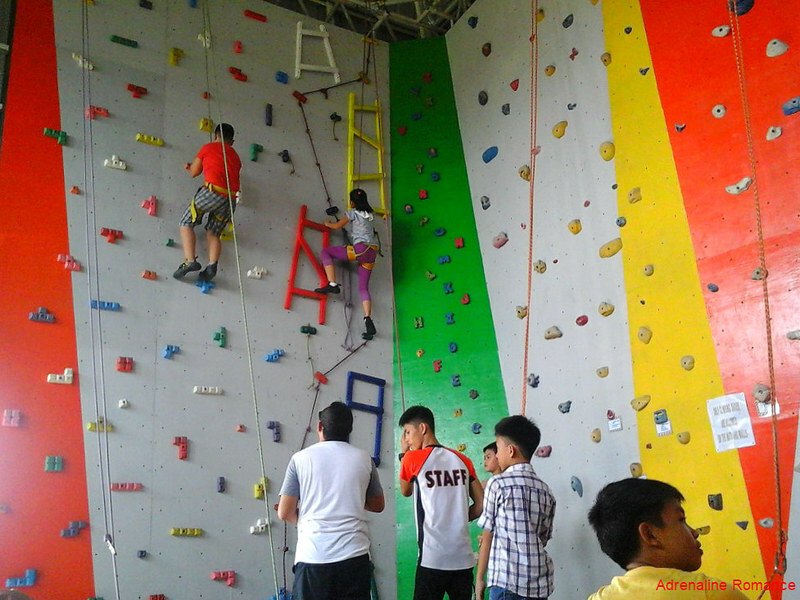 The Adventure Central wall is divided into kiddie, easy, intermediate, and hard sections. Thus, they have routes for all skill levels. Unlike many climbing walls we’ve seen, the one in Adventure Central is impressively neat and clean. That’s because they do not use multicolored tapes to mark holds. 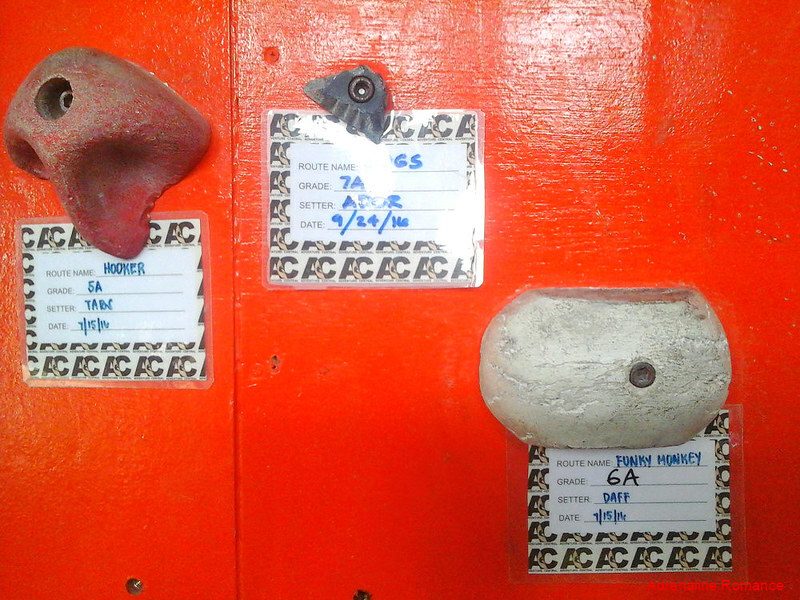 Rather, climbing routes are marked by colored holds. For example, you can climb red-colored handholds and footholds only. Each climbing route is identified by a card that states its name, its climbing grade, the person who set the route, and the date the route was established and first ascended. To set your own route here is a great honor. 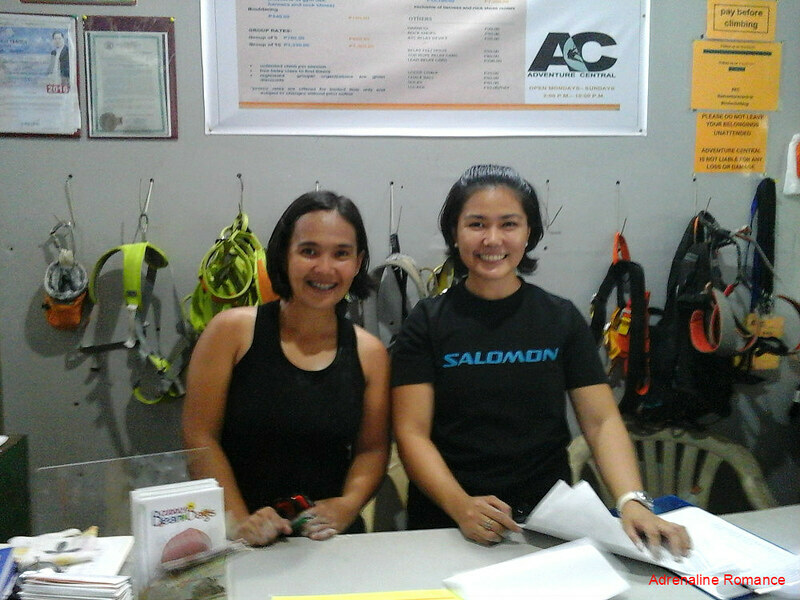 Skilled and friendly instructors ensure that climbers are totally safe. They make sure the climber is having fun and help him improve his climbing technique. The kiddie wall is positioned right beside the entrance. 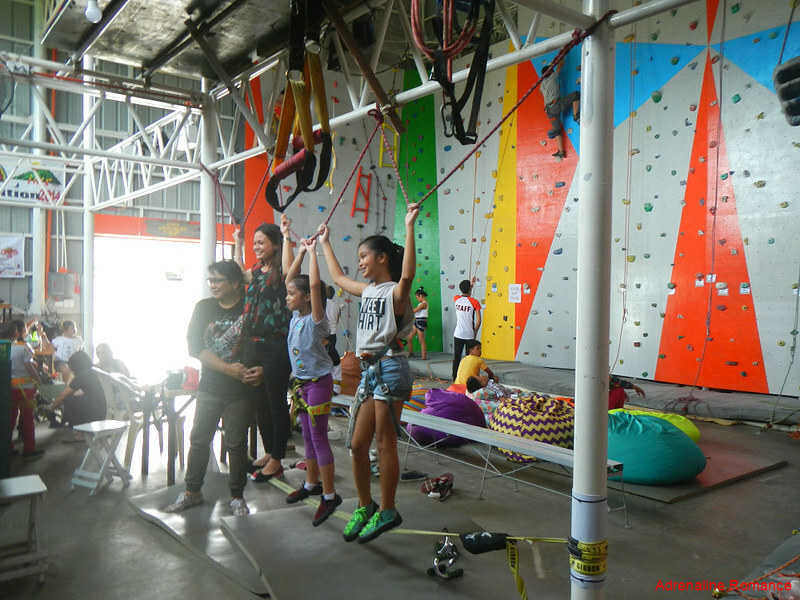 Kids love colorful and fun stuff, so Adventure Central made sure that this wall becomes a great playground for them. Check out those cool, colorful Tetris-block style holds and those ladders! They even have holds that are shaped in the letters of the alphabet! Improving climbing and spelling skills? Why not? Go, little girl, go! It’s never too early to delve into the sport of climbing. In fact, 15-year old Ashima Shiraishi, considered to be one of the strongest and most skilled of world-renowned young climbers, got hooked on the sport when she was still at a tender age of six! Climbing is not only fun. The sport also helps strengthens a child’s physique, improves her mental and problem-solving abilities, teaches her the value of teamwork and sportsmanship, enhances her self confidence, and helps her stay away from bad influence and harmful vices. These teens helped themselves with routes on the intermediate wall. They had the time of their lives! If only teens of today do more productive and enriching stuff such as climbing, enjoying the vast outdoors, honing a musical or literary talent, learning a new skill. . . In all honesty, we pity young people whose world revolves around gadgets, malls, late-night parties, and money. 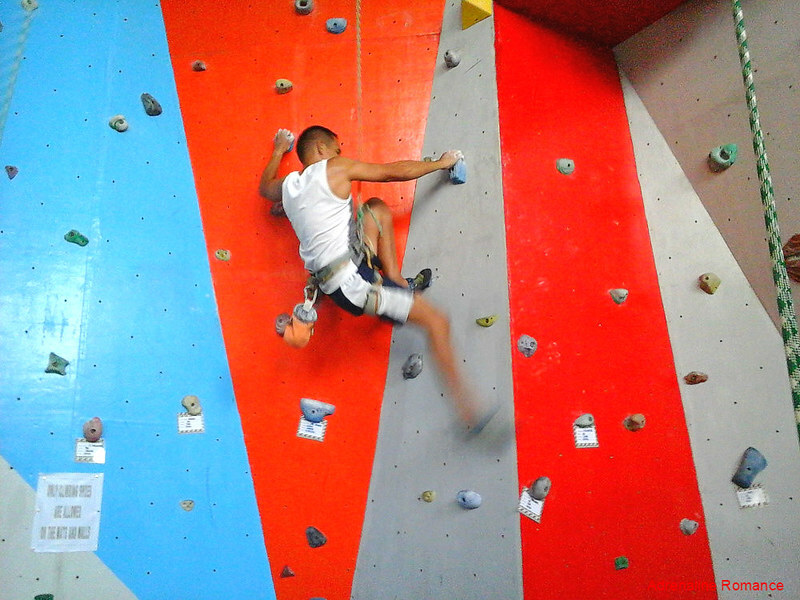 Adventure Central often holds friendly, local, and national bouldering and climbing tournaments. Or they might simply want to establish new climbing routes to test or improve their skills. In such cases, AC staff climb up the wall to affix new holds. This can easily and quickly be done because because the wall has numerous attachment points that connect holds to the sturdy industry-grade steel behind the wall. Finally, at the far side of the facility, is the hard wall. We tried some of the routes and, oh boy, they are hard! And challenging! And super fun! The wall is characterized by tiny holds, super slick slopers, overhangs, and a small roof. 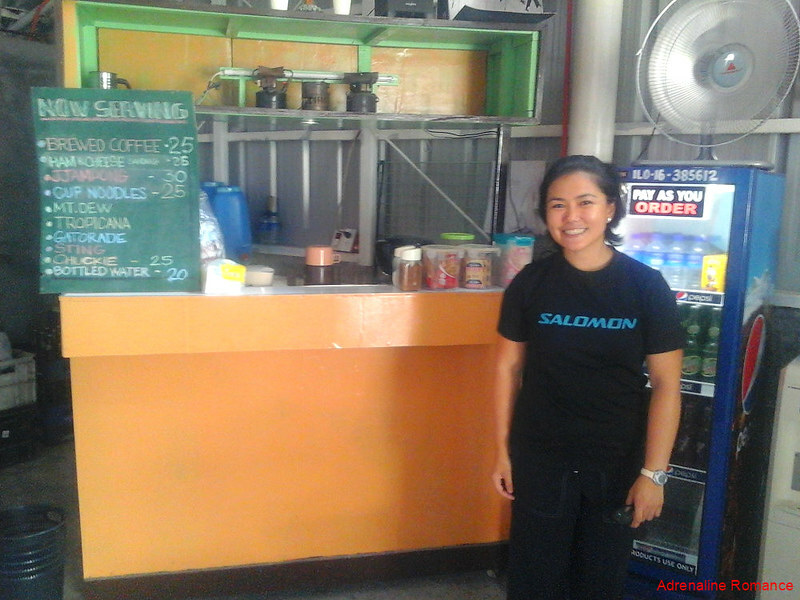 Our close climbing friend Gretchen makes Adventure Central her home in Iloilo. Hehehe! Way to go, Gretchen! Across the wall slackline offers a lot of fun and helps climbers improve their balance. AC’s resourceful staff also improvise slings and holds as training equipment for climbers who wish to improve their grip strength, increase their upper body power, and more. Okay, it’s time for us to stretch out our limbs on the sport that we love most! Sweetie had a couple of hours of great, sweaty climbing fun on some of the routes with moderate difficulties. On the other hand, after warming up, I challenged myself on the more difficult routes. All the routes we tried are excellent and true to the grades. Climbing can be quite strenuous. 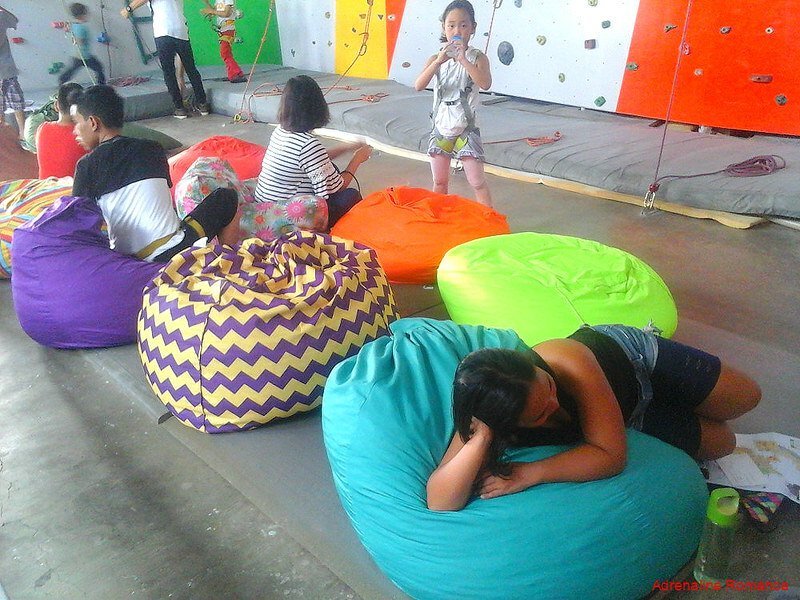 Thus, Adventure Central provides beanbags for tired climbers and spectators to relax. 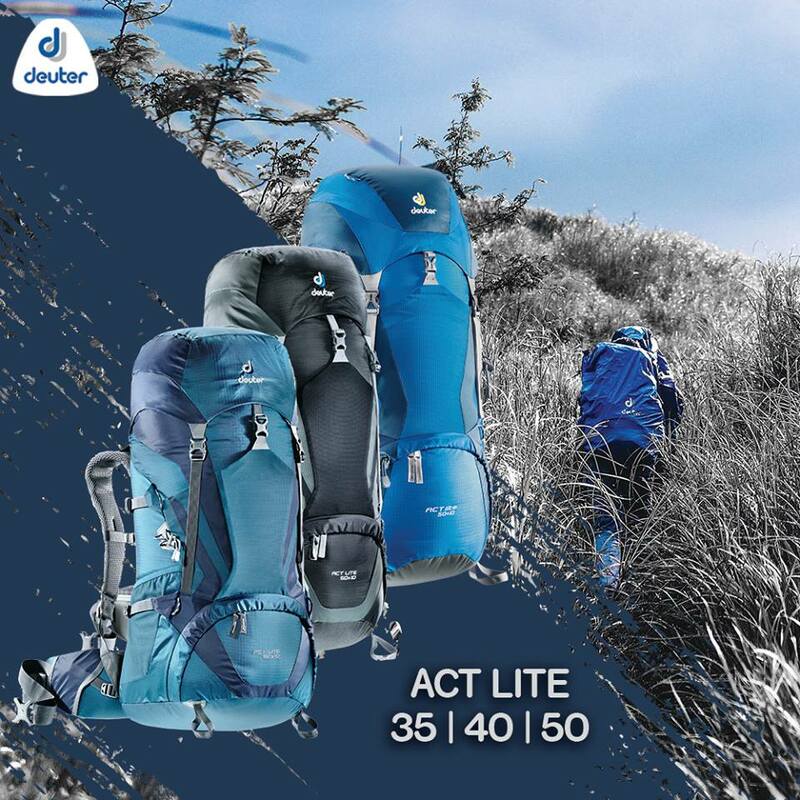 The bags are so comfortable that we might as well take a nap than climb. Hahaha! These soft and high-quality beanbags are from Cuddly Bean Bags. Adventure Central is not just about climbing. Indeed, they also have other events that are equally fun and healthy. 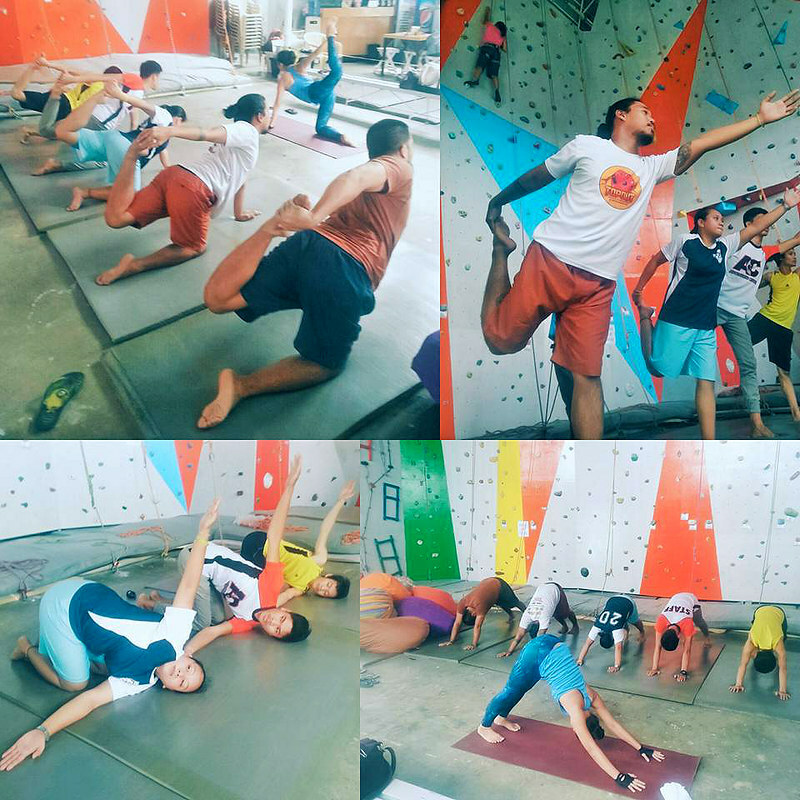 For instance, to help climbers improve their flexibility, they hold regular yoga sessions. Test your skills, exceed your limits, and compete with other climbers. 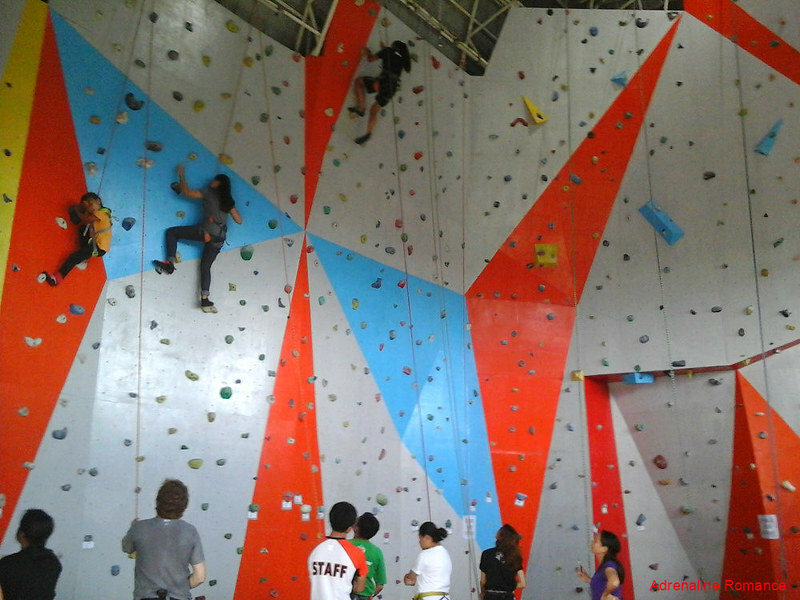 Adventure Central also organizes bouldering and climbing competitions. Thank you very much, Shanelle, Adventure Central co-owner, for welcoming us and being such a kind host. It is totally awesome that you provided Iloilo and nearby areas an ideal venue for fun, fitness, sport, and friendship. 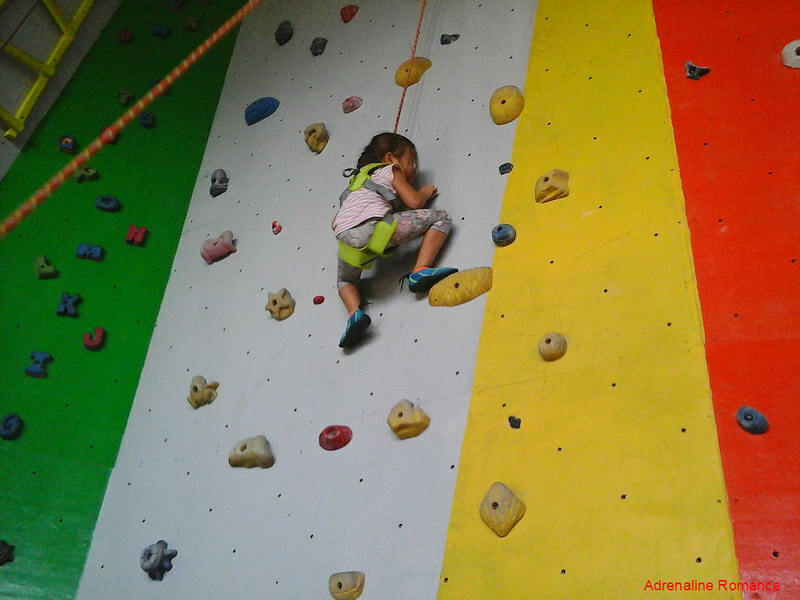 Although expert climbers frequent the climbing wall, Adventure Central is a very child-, beginner-, and family-friendly place. We would also like to thank Cyril Tabion (beside Sweetie), fellow climber and AC instructor, for assisting us during our stay there. 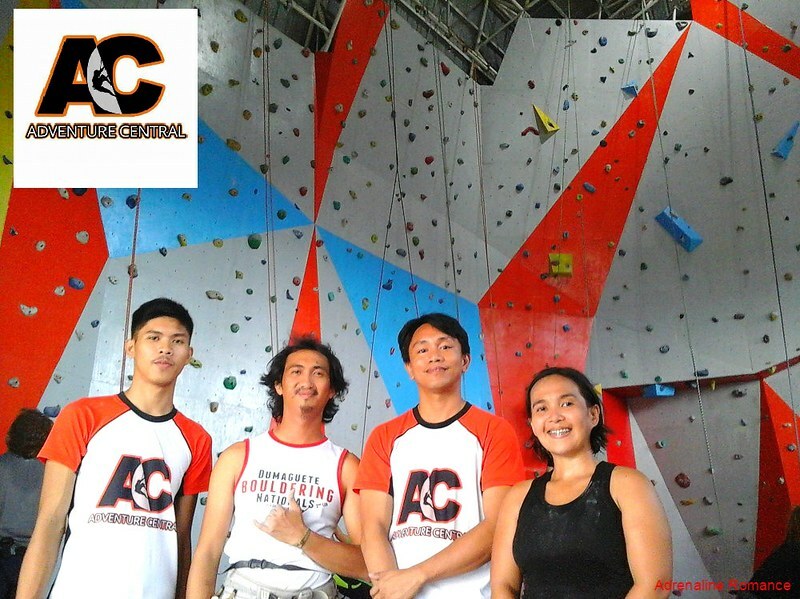 Huge thanks too to Shaun Marquez (guy with AC uniform), Edcel Margarico (guy in tank top), and the other staff of Adventure Central. They are excellent climbers, professional instructors, and amazing friends. 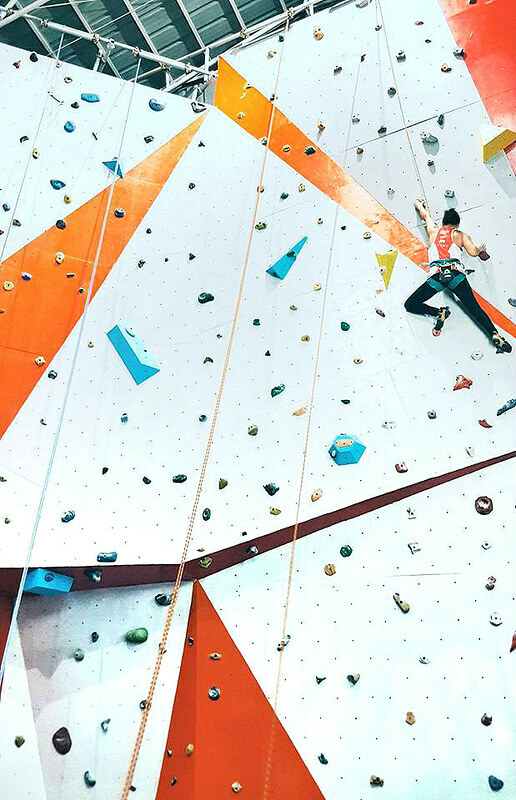 We have to tell you—climbing, whether in an indoor climbing wall or wrinkled cliff, is absolutely addictive! Once you start having fun, it quickly becomes your drive and passion. You learn various life lessons from the sport as well as make great friends with cool, adventure-loving people. So what are you waiting for? Bring yourself, your kids and family, and your friends to pump up those muscles! 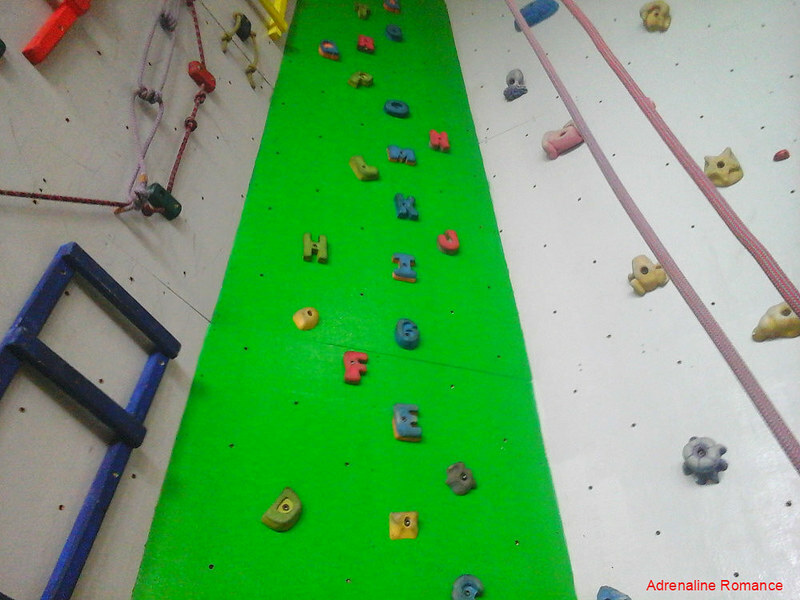 Start climbing at Adventure Central today! 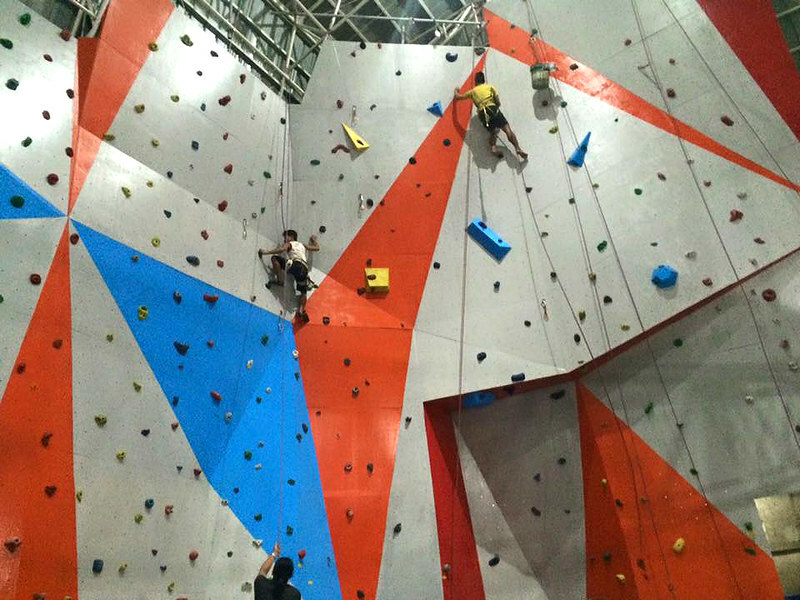 Adventure Central offers individual and group climbing classes. They also book special and corporate events. I heard there is one like this in Lahug, but we haven’t been there. I’m sure it’s real fun and as you say “addictive”. Oh, yes! 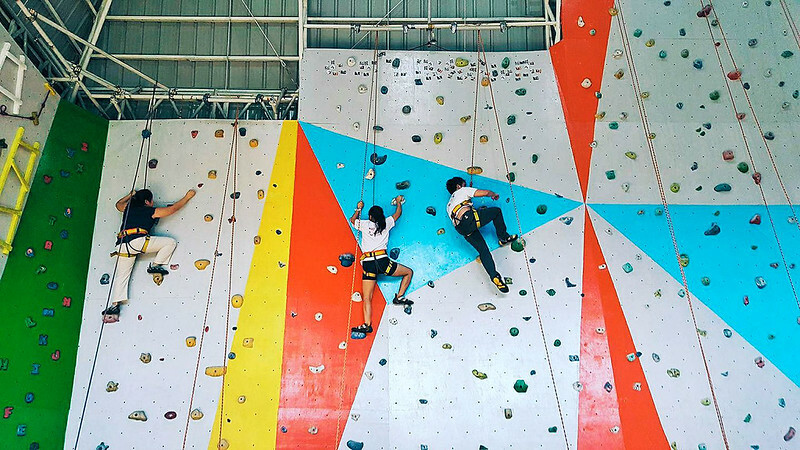 Wall climbing—and rock climbing—is really fun! 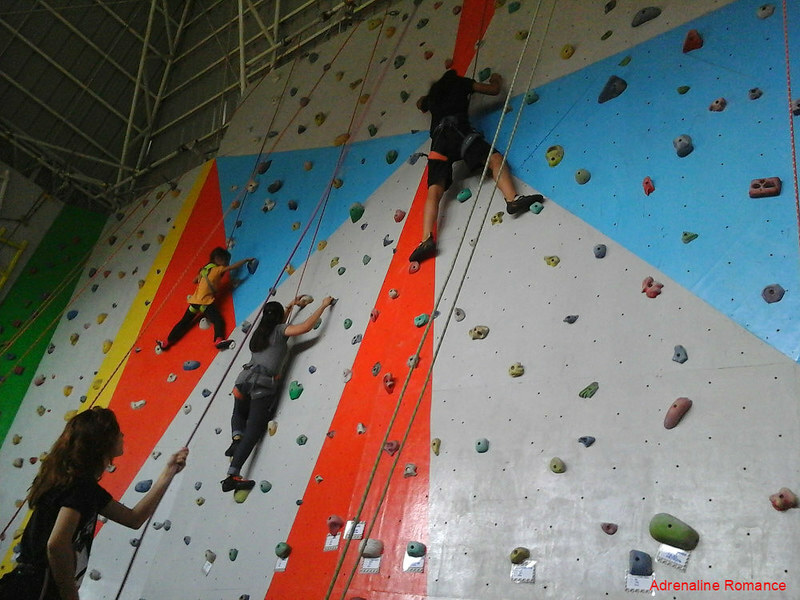 In fact, we started our rock climbing journey not as a sport but as an addition to our mountaineering skills. But the more we rock climbed, the more we got addicted to it! 🙂 Hehehe! This Cristmas holiday(Sat-Mon)& New year holiday(Fri-Mon) will open? 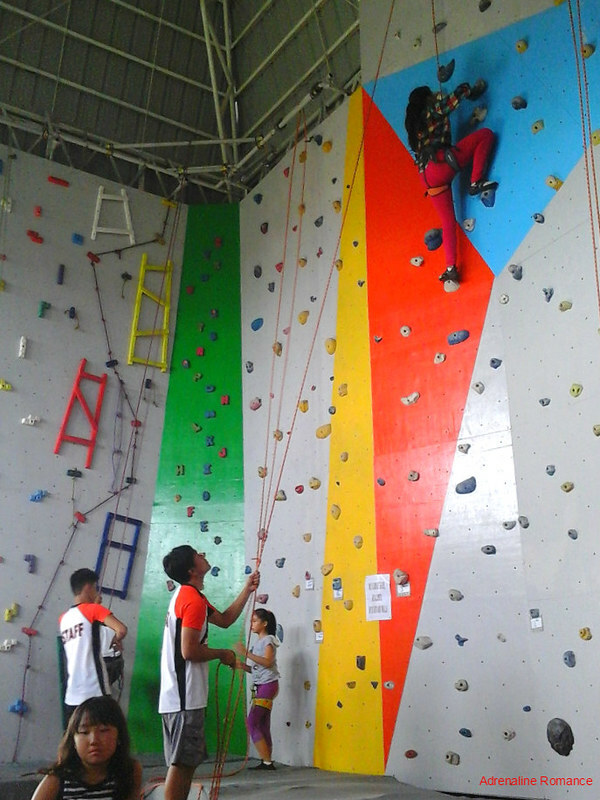 I tried for the first time wall climbing at one resort in Zamboanga and it was exhausting. Though it was not high, my arms were trembling and I even fell down. Poor me. hahaha. But I want to try again and practice and this is one awesome venue for practice! 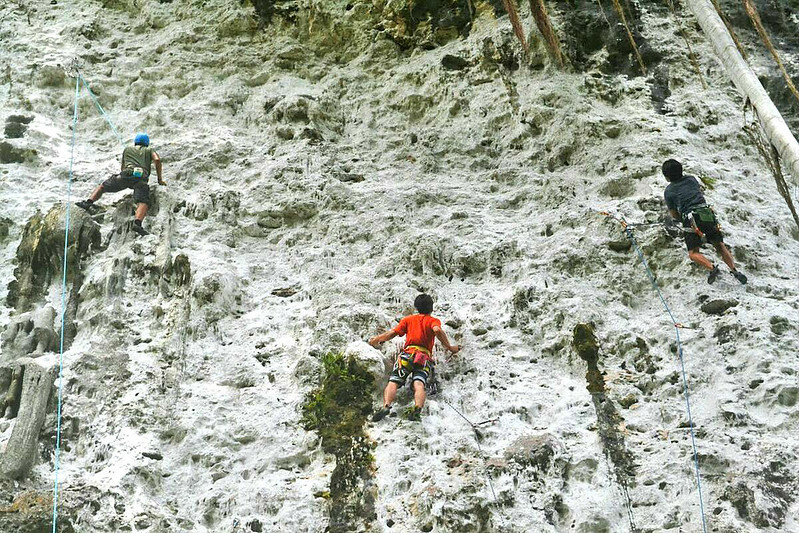 nice ning wall climbing.. have tried it sa plantation bay last december..
murag naghinam nuon ko mopalit og rock climbing shoes. hi, would you be able to do outdoor climbing at the end of july? I have friends from europe who are very keen to try climbing in iloilo, im trying to organize it for them.